Is High-Fructose Corn Syrup Bad for You? Last month, I saw an interesting commercial where a mother was throwing a birthday party for her five-year old. She had a fruit drink that was sweetened with high fructose corn syrup and another mother scolded her for serving it. She replied that it was ok, because high-fructose corn syrup is all natural and made from corn, so what could be so bad? Up to now, my only qualm with high-fructose corn syrup was that it is being added in higher quantities than necessary to so many packaged and bottled foods. Excess consumption of calories and sugar is a serious issue for Americans and probably one of the factors responsible for the rapid rise of obesity over the last 30 years. Americans eat around 150 pounds of sugar a year – in 1970, it was only 120. So that means the average American is eating 6 cups of sugar a week, mostly in the form of high-fructose corn syrup. So What is High-Fructose Corn Syrup, and Why Could It Be Harmful? High-fructose corn syrup (HFCS) is a sweetener that is found in many packaged and fast foods – everything from crackers to cookies, ice cream and jarred sauces. It originates from corn syrup that has undergone enzymatic processing to increase its fructose content, and is then mixed with pure corn syrup (100% glucose), becoming a high-fructose corn syrup in the process. As it is a liquid, HFCS has become popular with food manufacturers because it is easier to blend and transport – besides, it is somewhat cheaper than table sugar due to corn subsidies and sugar tariffs. So next, I asked my husband, who has a Ph.D. in organic chemistry, what happens in the body when we eat lots of fructose versus other types of sugar. 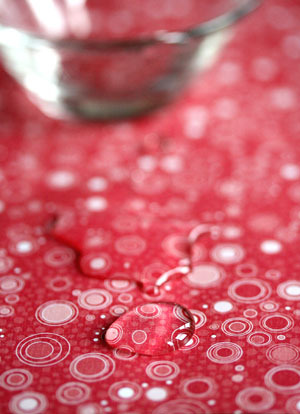 As a liquid, HFCS has become popular with food manufacturers because it is easier to blend and transport. “I prefer to talk about the research out there” he said, forever the scientist. Enter clinical researchers such as Richard Johnson, the J. Robert Cade professor of medicine and chief of the division of nephrology, hypertension and transplantation in the University of Florida College of Medicine. For starters, insulin is released from the pancreas, prompting the body to balance out the glucose levels in the bloodstream. And secondly, glucose is signalling the brain that sufficient energy is available, causing the release of satiety hormones that make you feel full. By comparison, fructose is not able to enter the brain – so the brain doesn’t respond to your fructose energy intake and in response, your body never gets the signal that your stomach has been filled. You just keep eating and eating and while your stomach expands, you never get the neurological sensation that you’re full. A perfect setup to becoming overweight and obese. 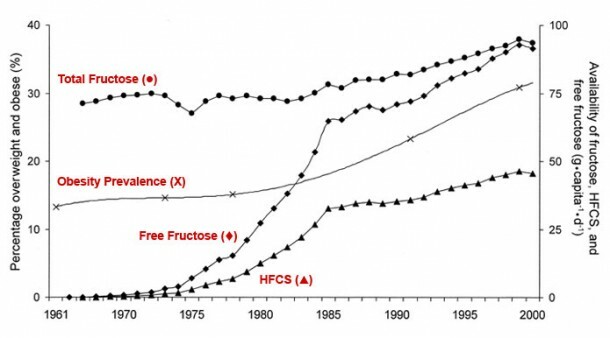 The above graph shows how overweight & obesity rates (1980: 15%; 2000: 28%) rose simultaneously with the increased use of high fructose corn syrup in the 1980s and 1990s (5 vs. 45 gram/capita/day). A related graph also indicates that ten years after the increase in obesity, there’s an increase in diabetes cases. Many experts, including Richard Johnson, say that it’s hard to argue with those correlations. If you have pre-diabetes or diabetes, chances are that you’ve heard of the medical term insulin resistance syndrome or metabolic syndrome. Both of these terms describe a combination of health problems that have a common link – an increased risk of early heart disease. The cluster of medical conditions that make up metabolic syndrome places a person at risk of developing type-2 diabetes and atherosclerosis (hardening of the arteries). It is estimated that 70 to 80 million Americans already have one of the metabolic syndrome diseases such as obesity, type-2 diabetes, high blood pressure, abnormal cholesterol levels, or heart disease. Secrete insulin in response to elevated glucose (blood sugar) levels. This hormone causes sugars to be removed from the blood stream, either for direct energy consumption or to be stored in the form of fat. People who consume persistently too many calories tend to have high glucose levels, that can not be reduced by further insulin secretion. As a result, the body stops or reduces insulin release, and people face insulin-desensitization. Persistently high glucose levels then change many other biochemical processes in the body, the ultimate result being diabetes. Further downstream events also reduce circulation, so that less nutrients and antioxidants reach the extremities – making amputation of legs necessary in many cases. So do yourself a favor and combat excess weight and obesity early on in your life. By addressing these in time, you’ll not only feel and look healthier, you may also escape the guaranteed onset of diabetes with all its associated complications. Join my Kick Start Weight Loss program that gives you concrete examples of what you can do RIGHT AWAY to lose weight, without giving up your cravings and favorite foods. Over the course of five days, you’ll get a daily email with tips, secrets and important insights. 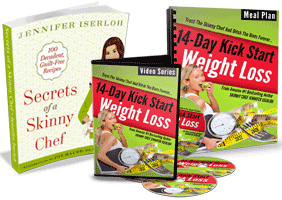 In several audio segments, I’ll also share my own personal story and how I became the skinny chef. 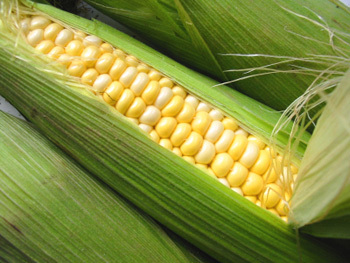 Is the corn surplus responsible for the way American’s eat? Read more from the brilliant writer and food expert, Michael Pollan. Read more about the facts of corn sweeteners by Marion Nestle. Consumption of high-fructose corn syrup in beverages may play a role in the epidemic of obesity, George A. Bray, Samara Joy Nielsen, and Barry M Popkin, Am. J. Clin. Nutr. 2004, 79, 537- 43. This is an excellent post. Succinct and to the point. One additional comment that I have is the role high-fructose corn syrup plays in children. It not only promotes childhood obesity, diabetes, heart disease, but also affects their neurological development. It contributes to attention and hyperactivity disorders, mood disorders, and simply poisons children. This Blog rocks. The Skinnychef is aw-some and right on the money, the above e-article is great and timely….keep them coming …5 stars out of 5!! I have heard that artificial sweeteners are really bad for you. My husband drinks those “crystal light” type drinks all day. Ugh. He used to drink apple juice all the time, but switched to reduce the calories. I know water is best, but what a healthy drink alternative for him? A great alternative would be flavored sparkling water. They are calorie free and have natural flavorings. I used to be a “soda-holic” when I was a kid, so when get the random soda craving I mix 1/4 cup of grapefruit juice with plain sparkling water. I use grapefruit juice since it’s naturally low in calories and has lots of vitamin C. Your husband could also try ice water with chopped mint, orange, lemon, or lime zest. Again, hardly any calories but the mint and zest add flavor. Thank you so much! I will give that a try! Your site is wonderful, filled with loads of great information! Jennifer, Thanks for posting this info, I have heard it was bad for us but it was good to hear the true details, thanks so much for all your valuable info. Yes there is a difference between corn syrup and high-fructose corn syrup. Both of them are synthetically-derived, or simply produced in the lab. Corn syrup is synonymous with “high-content glucose syrup”, in other words, it is largely made of glucose. High-fructose corn syrup is made of both glucose and fructose, or a larger portion of its chemical make up is fructose (about 90%). I would discourage their uses in any of the foods, or cooking. They are both dangerous and harmful to your health. I have been baking for many years. one of the ingredients I use is corn syrup. I have recently noticed a change in the lebeling contents. Kero syrup now list corn syrup and HFCS seperately. 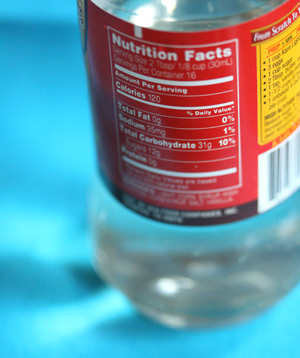 Is there a difference between corn syrup and HFCS? No one seems to be able to answer this. I have noticed a difference in my baking results. I use many other things in the baking process like fruits to help create sweetness. If I have yougart, I get unsweetened Greek yogurt and mix fresh fruit. In water I squeeze fresh fruit juice ( IE I puree strawberries, blackberries and strain them) It makes for what I think is a healthier drink with great flavor. I’m a huge fan of the Greek yogurt and use it often in recipes- all great, healthy ideas for baking!! I have to say this article is really helpful. I started researching HFCS and it’s link to hyperactivity. My 5 year old son is VERY sensitive to HFCS. I happened upon that little tid-bit accidentally. I happend to have made a cake from scratch (frosting and all) and he didn’t have NEAR the reaction that he NORMALLY has when he ingests cake and frosting. So, I started playing with his diet and with the help of his teacher, eliminated the HFCS and he’s a different kid. The New York Times just posted a whole article about Showdown at the Coffee Shop, discussing the merit and history of Sweet ‘N Low (saccharin), Splenda (sucralose), Equal (aspartame) and a newcomer, Truvia (stevia). Regarding the HFCS that is in widespread use as a sweetner in the U.S., it should also be mentioned that MOST of the HFCS that is used to sweeten food and beverages is made from (GMO)genetically modified corn, and that fact could also present other health risks to consumers. this is the best website ever!!!!!!!!!!!!! Everything that I have ever read about HFCS suggests that it is not healthy. I have been able to eliminate it almost completely from my diet. I suggest others do the same. I am doing an experiment with myself I’m going to do away with any product that has HFCS listed as an ingredient to see if I feel better, any type of weight loss..and so on. I’ve read other sites on this subject and people who did nothing to there lifestyle but take this out and ended up losing an average of 25 – 30 pounds within 3 months..
Well I do eat cooked green peppers and red peppers at night don’t know if it’s a cup because I don’t measure it. Actually for my 3pm snack I either have Whole Natural Almonds (not with any extra flavors just plain) or I eat 6 to 10 baby carrots. I was eating 100 cal kettle corn popcorn for this snack but after a while I got tired of pulling popcorn from my teeth…LOL.. But actually I stopped eating pettridge farm raisin and cinnemaon bread as of Feb. 17th (gave it up for lent) I’m not feeling as sleepy in the morning..I found out that one of the main ingredients in that is HFCS…probably for the cinnamon. I guess I already knew that HFCS was very bad stuff. Now I know why. And reading about the science didn’t make me want to jump off of a bridge (like it usually does). This is very helpful info, thank you.